The Greatest Movie Ever-- depicting the clash of cultures and the battle against religious fanaticism. The classic 1961 movie today has increased relevance and importance. The Donald Trump candidacy represents the return of American patriotism-- of American populism. The renewal of American culture and American values. The question: Can America's resurgence be part of a larger renewal of Western/Christian civilization? The U.S. mainstream media is reluctant to designate the perpetrators of the tragedy in San Bernadino as terrorists. But in a sense, the couple were not terrorists. The word “terrorist” doesn’t encompass what’s actually going on. It’s not a large enough word. What they, and those who committed the massacres in Paris, are is revolutionaries. They’re Islamic revolutionaries because what they seek to cause is not mere terror, but the overthrow of Western civilization itself. Europe’s decline came with its rejection of Christianity. This was cultural, historical, and spiritual suicide. The replacements—secularism, Marxism, paganism—were inadequate. Europe, center of Western civilization, lost purpose and meaning. The culture became a wasteland as birthrates declined—and a different people who believed in something entered. Faith, no matter how twisted, encountered weakness. The script had been flipped, because the scenario mirrored what happened when Christians like Cortez encountered uncertain Aztec Montezuma. The Aztecs were impossibly wealthy—but lacked the will to defend their empire. The only thing which can save Europe is re-Christianization. Revival. Waking up to its heritage and embracing it. WE SEE from events in Iraq, Nigeria, and around the world that evil has emerged in this universe. Evil from within man. The stark scary images from “El Cid” have become real. Fanaticism has raised its head. It won’t be defeated by contemporary European (and increasingly, American) passivity. Only by the strength of heroes who believe in the true God of peace and love—who carry the chivalric virtues which once made Western civilization irresistible. With radical Islam on the march across the globe, from Nigeria to Pakistan to Iraq, the 1961 movie EL CID, the greatest movie ever made—the ultimate cinematic experience—is more timely than ever. Fanaticism 1,000 years ago. Fanaticism now. One can contrast the epic new “Noah” movie with “El Cid” to see how America’s cultural psychology has changed in 50+ years. Like all movies today, “Noah” looks dark. The dark shadings of the costumes and cinematography match the story’s dark tone. Our civilization is going through a period of cultural despair. Values have been rejected. The future appears hopeless. “El Cid” used darkness as counterpoint. As an opposite. That which must be fought. The bulk of the movie presents brightness—the gorgeous colors of nature. It’s a pleasure to view. 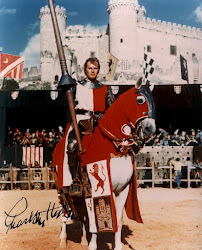 “El Cid” is one of the most beautiful looking movies ever produced. Anymore, that seems to be the choice. (Excluding mindless hedonists of course.) We’ve seen what happens to nations which have rejected faith. Russia—the remains of the Soviet Union—is a case in point. Vladimir Putin is nothing if not a rationalist. He witnessed the fruits of socialism and atheism. Russia is a dying nation. He’s struggling to reverse this. In so doing, he recognizes the necessity of religion. The benefits of spiritual purpose—portrayed so well in “El Cid.” A belief. A cause. Something higher than the here and now. Russia is trying to renew itself, to climb out of the deep well of despair—while we’re moving tragically in the other direction. One of the strengths of El Cid is its structure—the way it builds in theme and intensity, first to the intermission; then, quickly, to the final mammoth conflict between the forces of evil versus good; of intolerance versus light. Part of the narrative’s appeal is Rodrigo’s insistence on thinking beyond the narrow limits of his fellow Christians. He understands that they need to join forces with moderate Muslims, if they’re ever to unite the peninsula. Rodrigo bucks the system throughout, at high cost—culminating in his forced exile. He’s joined in that exile by his estranged wife, Chimene, which brings the personal, emotional part of the drama to a peak. Anthony Mann’s handling of this is masterful—the couple’s encounter with each other on a snowy night: a mystical moment when viewed on a giant movie screen. The elements are so much part of the scene, intimations of destiny and fate, we’re given a subliminal glimpse of the spiritual, which will be evoked again at the very end of the film. Rodrigo’s journey as “the purest knight” is physical, part of the political conflicts of his day, but also spiritual, as he allows himself to be utilized by a force greater than himself: the Christian God. After they spend a night together in a barn, Rodrigo and Chimene realize they’ve been joined by a small army of followers willing to share their banishment. This army rides off, to thrilling Miklos Rozsa music, and the intermission begins. The first act is as exciting as any movie ever made—exciting dramatically, visually, and emotionally. yet much more remains. The conflict with Ben Yussef, prepared for from the film’s first moments, will now move into higher gear—and Rodrigo’s life will reach its final purpose and end, as the movie achieves final unity. The lines of narrative—physical, personal, political, spiritual—move in unison, toward interim climaxes in the first act, then toward the larger climax of a final, Armageddon-like battle, through which Rodrigo, “The Cid,” achieves apotheosis as hero. The movie is greater than others not solely in its surface elements of cinematography and sound (including the score), but also in its superstructure of narrative, and through narrative, theme. The film’s larger meaning is civilizational. El Cid is a story of the battle of Western civilization—the creation of the world we still live in. That struggle to hang on to our glorious heritage goes on. Karl Wenclas is a long-time arts promoter and classic movie buff. Contact: elcidproject AT gmail DOT com.